It may surprise you to know that 67% of people are unhappy with their smile, but whatever age you are there is no need to live with imperfections. If missing teeth or a poorly fitting dentures have left your face looking sunken, then you’ll benefit from dental implants. To fill any gaps left by missing teeth or stabilise loose or rocking dentures, dental implants are a cutting edge solution to improve the appearance of your mouth. Whether you have one tooth that is loose or you need a few teeth replacing, dental implants are a reliable and effective solution. Prior to securing the dental implants, at Mossley we’ll investigate the condition of the bone in your jaw and graft new bone if it is required. The implants are a titanium screw that is inserted into the jawbone in the same way as a natural tooth under a local anaesthetic. After a few weeks to allow the area to heal properly, the replacement tooth will be secured to the titanium root. Following this, we ensure that your jaw and bite are balanced by using a T-Scan. 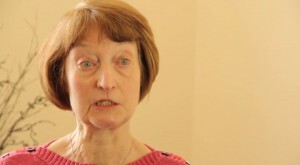 The treatment is minimally invasive and because it is done under local anaesthetic is relatively painless. The dental implants are barely distinguishable from natural teeth and should last just as long if they are cared for and you ensure that all maintenance appointments are attended. With over 25 years of experience in transforming our patient’s smiles and giving them back their confidence, we pride ourselves on offering competitively priced treatments to the Greater Manchester area. The idea of dental implants can seem daunting which is why we encourage our patients to come in for a no obligation appointment in order to discuss the best options for your orthodontic situation. No matter how long you have lived with missing teeth or loose dentures, with dental implants at competitive prices there is no excuse to avoid orthodontic treatments. Contact Mossley today to achieve the perfect smile that you can’t stop showing off. To replace a missing tooth, a titanium root shaped implant is placed into the gum where your natural root would have been located. After a short healing period, a porcelain replacement tooth is bonded to an abutment (or connection) placed into the titanium root. The implant procedure itself is minimally invasive and is performed here in the practice under local anaesthesia. 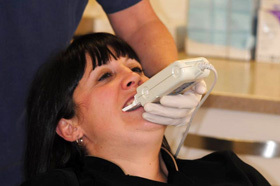 We also ensure that your jaw and bite is balanced after implant placement by using our T-Scan process as shown below:- During treatment, a local anaesthetic is used with the dental wand® if required to offer almost painless injections. After treatment a mild painkiller may be taken if there is any discomfort, but this will soon pass and a soft diet can be eaten within hours of leaving the dental surgery. During treatment, a local anaesthetic is used with the dental wand® if required to offer almost painless injections. After treatment a mild painkiller may be taken if there is any discomfort, but this will soon pass and a soft diet can be eaten within hours of leaving the dental surgery. 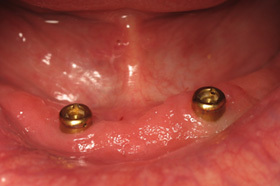 mplants can be placed to secure a denture. The denture can be fixed to the implants with a ‘press stud’ attachment, providing you with a snug and solid fit. 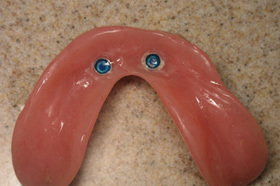 Midi implants, an example of which is shown below can be used to help retain and secure lower dentures. 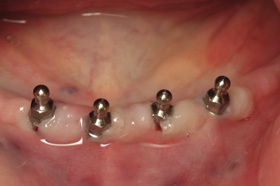 Four midi implants used to retain a full lower denture. 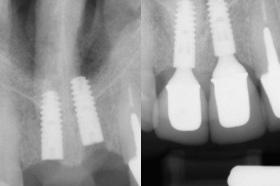 Dental Implants are replacement teeth. 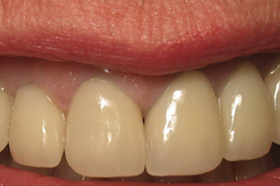 If you have lost a tooth or have a tooth that requires extraction you do not need to leave a gap anymore. 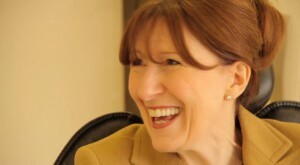 We offer dental implants to replace missing teeth. Other options are available such as bridges and dentures, but the advantage of a dental implant is that it is fixed in place and is secured into your jaw bone so are very stable. Dental implants involve a minor surgical procedure that can be done under a local anaesthetic. Dental implants need to be planned carefully by an experienced dentist. At Mossley, Mr Watson has over ten years’ experience placing many hundreds of dental implants. Once your case has been planned the patient is usually given a local anaesthetic, the implant placed and then left to allow it to integrate into the jaw bone. Once the implant is stable, an implant crown will be placed on top of it, providing you with a new tooth which will not only function like a normal tooth but will look natural too. Every case is different and we can provide you with a quotation at a free no obligation consultation. We offer flexible payment plans so you can spread the cost of treatment. You may be surprised to hear that there is normally very little discomfort after having a dental implant placed. Some mild pain killers may be necessary for 24 hours but patients tend to cope with treatment very well. The procedure itself is normally done with just a local anaesthetic and when you are “numb” you cannot feel the work being done at all. However, if you are nervous you can request sedation to relax you during the procedure.